I've made some swingy tees. I actually traced a rtw shirt I bought recently. Here is a photo of the original shirt below. The brand is Sophie and Max. I don't do a lot of shopping anymore. Not since I started sewing five years ago. However, I have slipped up lately. I'm sure it has a lot to do with not having any time to sew. I'm trying to get back on the 'no shopping' wagon again. Sewing these tees was a good start. This particular tee that I copied has a great swishy shape. I have worn it to death since I bought it, despite it not being the most flattering top in the world. I have really been drawn to over sized, swingy tops here lately. I think if you get the proportions right, it can work really well. Not sure I've done that, but I still like my tees. The top reminded me of a circle skirt. I decided to make a copy of the top when I was making my circle skirts earlier this year. Here is terrible picture of the front pattern piece. 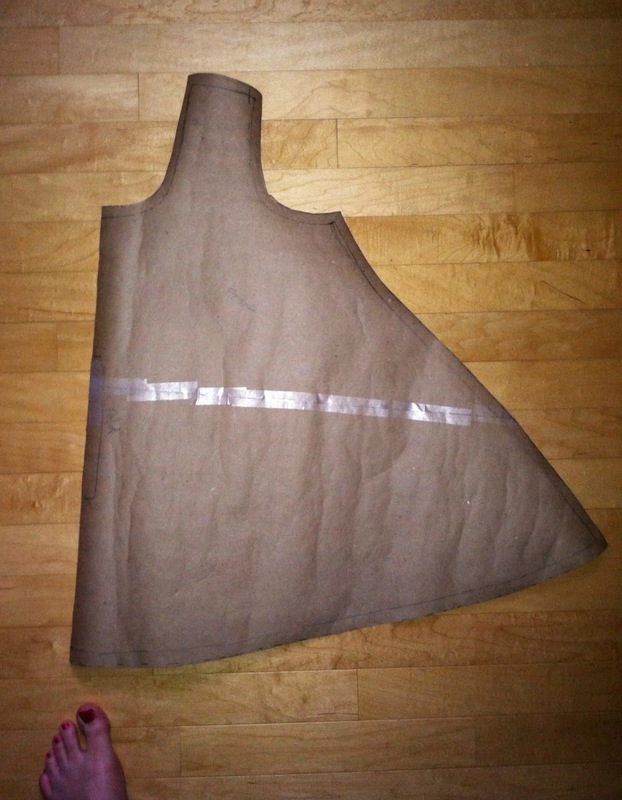 Both the front and back pattern pieces are fitted in the shoulder and then fall away from the body below the armpit. Shaped a lot like a circle skirt. The front piece actually has more width than the back, though, so not a perfect circle. Anyway, I used my traced pattern to make these three tees. I made the grey tee first. It is made from a cotton/rayon jersey. At first, it was the length of the original top. But the beefy jersey I used made it really stand away from the body and was crazy unflattering. So I cropped the front several inches but kept length in the back. It is a really exaggerated high low hem. I almost feel like I'm wearing a cape, which is kinda cool. I think cropping the front helped the proportions. I've worn it multiple times already, which is why it's all rumply in this photo. With jeans and with shorts- even with my old lady legs ;)- It's quirky and I really like it. I made this red poly knit version next. Excuse the terrible indoor pics. I made a shorter sleeve but I still cropped the front length. The fabric is super cheap. It hasn't held up very well in the wash, so this version will be short-lived. I made the pink version last. 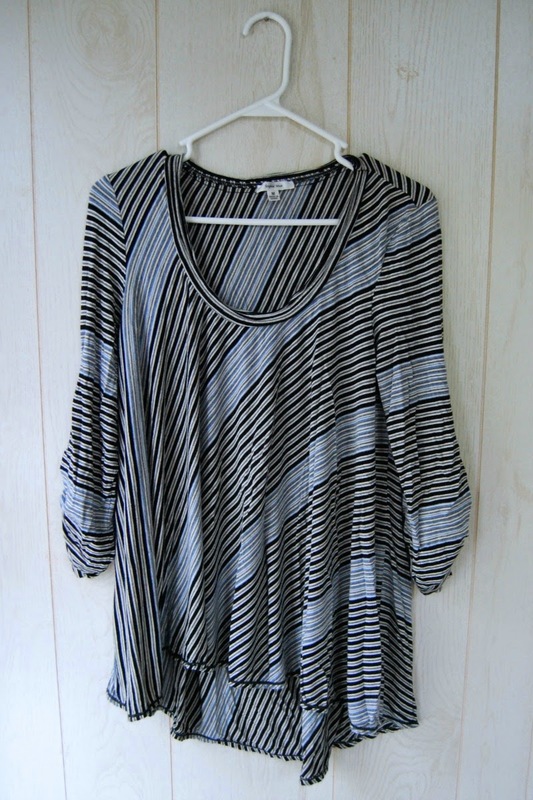 I used a super soft rayon knit with a lot of drape. I kept the original length. The clinginess of the rayon knit helps tame all the volume. It took quite a bit of fabric to make these tees, as you can see. I thought I was done making giant, swingy tees but I'm feeling the need for more. They are so easy to wear. Maybe a plain white one is my future! These like great! Nice to have a gratifying quick make...go ahead, make some more. 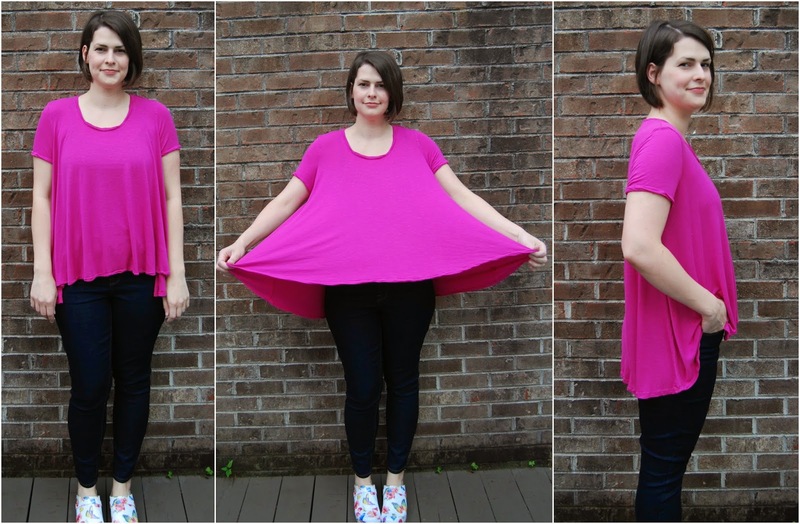 I like the evolution of this top and the proportions of the pink one. I think a good quality knit would do it justice. Love the styling in the first trio of shots too. T-shirts like that are such great basics! Love how you successfully turned a rtw garment into a pattern. I have yet to try that myself... Great look on you! These are sweet - thanks for posting your pattern piece (I love seeing them!). The drape on the pink one is gorgeous. They are so much more interesting than a regular t shirt, your hem idea is brilliant for making them look floaty and gorgeous rather than tentish. I really love the look of these t-shirts too. I feel the need as well! Did you decide what to do with your dress in the last post? I just saw that fabric again and think it is tooooooo gorgeous to not wear. The bodice is still sitting on my dress form- right where I left it a month ago. I think I'm going to tackle fixing it this summer when I'm off (I'm a teacher). The fabric is really special and deserves another chance I think!! :) Thanks! Those are wonderful! 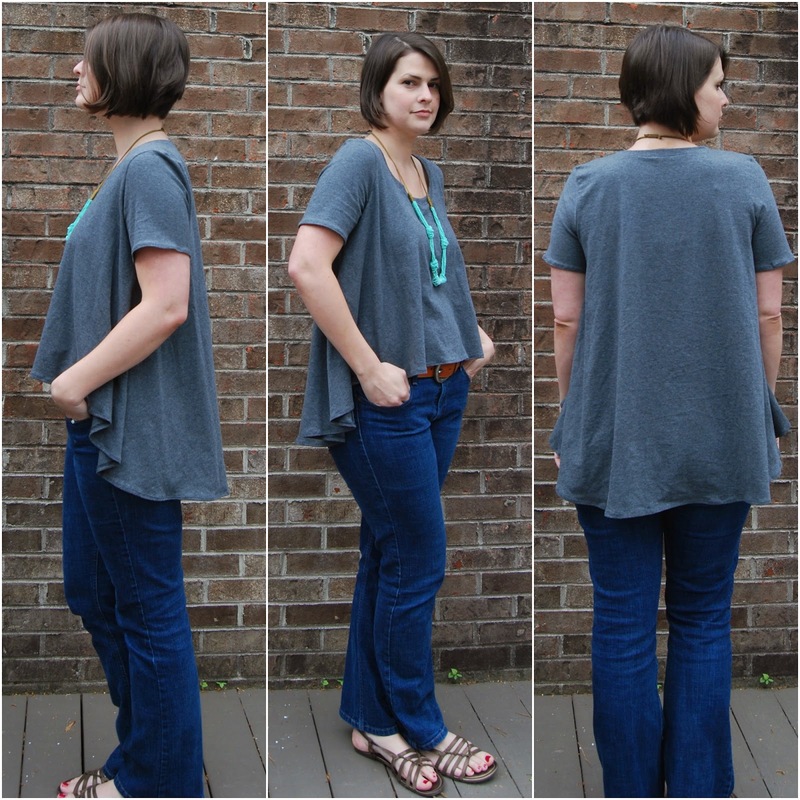 I love the high-low hem! 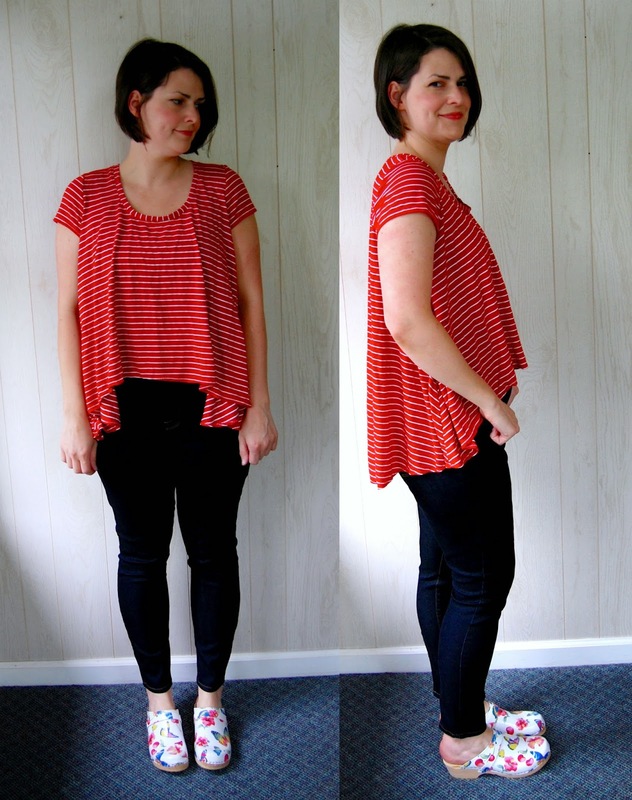 If you love shirts like that maybe you would like tessuti´s free patterns (Fave Top, Mandy Boat Tee or Zoe Top http://www.tessuti-shop.com/collections/free-sewing-patterns), they are similar shapes and great patterns! Ooh, thanks! The Fave Top looks right up my alley! Looks soooo comfy!! I like them all. How adorable! The stripe is my favorite but I can see the taupe working for so many months of the year. Very nice and great idea. Totally gorgeous! I'd love to have that grey one, the hem is such a dreamy shape. A drapy tee is a great staple for fine weather. I love the red stripy one. Whoa, that is a lot of fabric! They all look great on you, though! I love these. I like the style for all weathers - with a swingy cardi when it's cooler and without when the sun's out. It's good to have a change from fitted stuff sometimes! these look so comfy! i love it. totally filing these away in my memory for future use. These are awesome!! I love a good swingy tee, but it's harder than you'd think to get the volume right. Totally stealing this idea! Also, you have gorgeous legs!!! Must be some hot old lady you're comparing them too! Love em!! I can't get enough of swingy tees either - they're just so easy and comfy to wear, but still stylistically interesting. I say make a bunch!! Would be fun in a stripe too because you'd get that chevron effect on the side. And I agree with Nettie - if you've got old lady legs than that is one HOT old lady!!! These look so great! I was like, "ooh love the grey shirt", "ooh, red stripes, yay!" and then KAPOW, HOLY PINK SHIRT, BATMAN! The fuchsia is SUCH a great color on you! I love these! I love the flow and ease of this shirt. i feel like i would wear it all the time. Ahhh lovely! I especially like the stripey one. 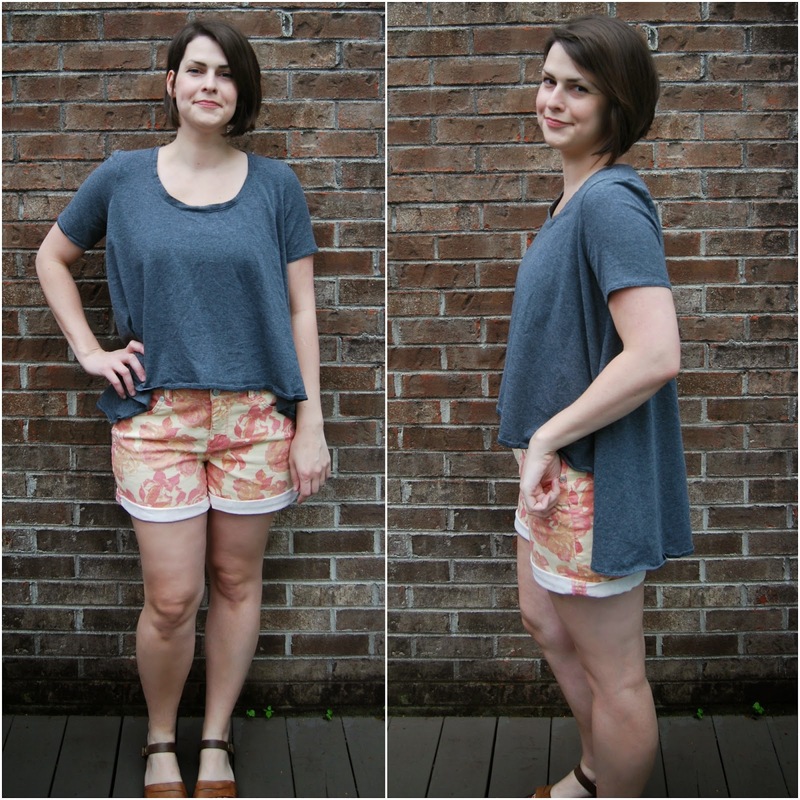 Do you feel like your style is changing now that you're a mom?